Dubh Artach is by far the most northerly lighthouse being investigated. It is owned by the Northern Lighthouse Board and is situated on Dhub Artach or St John’s Rock to the west of Scotland. 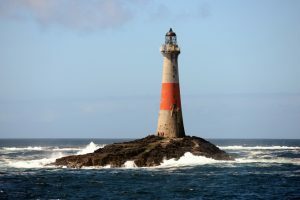 Whilst the top of the rock is well above sea level the tower experiences some of the very largest wave impacts, the cause of which is likely to be its situation at the head of a submarine canyon linking directly to the swell of the Atlantic Ocean. The STORMLAMP team are due to conduct modal testing of the tower in May 2017.